Sweet pea is the common name for Lathydorus odoratus. It is a member of the Leguminosae family, and, despite its name, doesn’t produce the pea vegetable, unlike other plants in the same family. This annual climber has a tendril that winds itself around its support and reaches one to two metres in height. It has sweetly-scented flowers that look like butterflies in white, red, pink, purple, lavender and a near blue. Propagating a true yellow has proved to be elusive and is likely to remain so without genetic modification. Lathydorus odoratus is native to the eastern Mediterranean, specifically the isle of Sicily, although some believe it originated in Sri Lanka. It grows best in a cool maritime climate or on a mountain, largely as a result of it first being grown in an island climate. 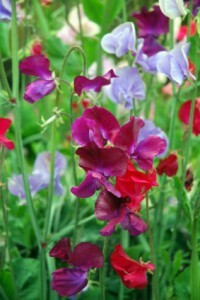 Sweet pea plants are mainly grown during the summer. However, some species are quite hardy, and can often bloom during the late spring, while others can last well into September and October, providing the conditions are favourable. The genus Lathyrus has 110 species and a large number of cultivars. Some peas, such as English peas and podded peas are edible, but the sweat pea and its seeds are toxic. Related flowers are often known as vetchlings. A short, little-known poem, Sweet Pea (Delicate Pleasures), dedicated to the plant was penned by renowned poet John Keats.